Gripsweat - The ACCENT Red Sky At Night WICKED 1967 UK HEAVY Guitar MOD PSYCH Demo 45 Hear! 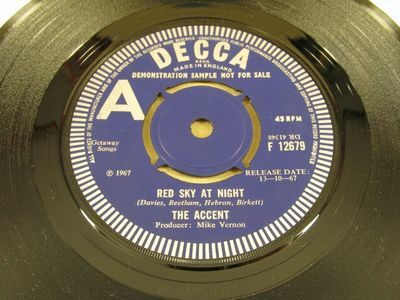 The ACCENT Red Sky At Night WICKED 1967 UK HEAVY Guitar MOD PSYCH Demo 45 Hear! Everything I offer is guaranteed. I try to note any flaws so that there are no surprises when the box arrives. Be sure to view my other iamthewitch auctions as I have other interesting items up for grabs this week. I ship all records in strong cardboard mailers with cardboard flats added to increase stability. The discs are always removed from their Picture sleeves or Company sleeves to prevent seam splits, and all items are dressed in plastic sleeves for travel. Please be aware that these supplies are expensive to purchase and may represent a small portion of my shipping charges. I pack/ship one day per week, usually it is Friday. USA: I can send this 45 to you by 1st Class Mail for $5.00. 1st Class Mail is the same service as Priority Mail at this weight. CANADA: If you are in Canada, I can send this 45 to you by 1st Class Airmail for $11.50. This service offers no tracking. If you want online tracking, ask me about mailing options. EVERYWHERE ELSE: If you are not in the USA or Canada, I can send this 45 to you by 1st Class Airmail for $15.50. This service offers no tracking. If you want online tracking, ask me about mailing options. Note to International buyers: I DO NOT USE EBAY's GLOBAL SHIPPING PROGRAM. Rest assured that your Customs forms will be processed by me and your package will be postmarked/mailed at my local Post Office. If you are unable to bid on my auctions, send me an email and I will try to fix the problem.